WBF is one of only a handful of organizations in the United States that solely identifies and adopts canines from animal shelters for its service-dog training program for veterans. It is the only one within the Midwest. Since its founding, WBF has placed 18 fully-trained service dogs with veterans with PTSD and/or traumatic brain injury. WBF provides the dog to the veteran at no cost. Veterans often say after receiving their dog and having it by their side, they can attempt daily tasks and social interactions that would have otherwise been too difficult or stressful prior to receiving their dog. In addition to the dogs it trains each year, WBF created its own social enterprise to bring the public out to its facility called Wildflower. Wildflower is a cross-country grass 5K course. CONRAD’S Dine 2 Donate program is about raising awareness & money for local charities. 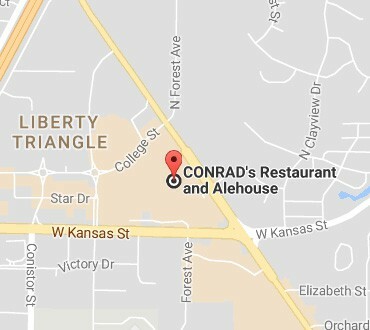 Every Tuesday night from 6pm to 10pm CONRAD’S donates 10% of food sales back to our nightly organization. Get the word out and let’s help Give Back to our community.